There are several options to stretch your fabric. It's very important that the fabric is as tight as possible because this will make the punching easy and fun. 1. Embroidery hoops are an option but only if they allow you to stretch your fabric really tightly. 2. In some countries so called carpet tack strips are a great option. They are traditionally used for installing carpeting. It's pre-nailed wooden strips. If they are available in your country (seek advice in a hardware store), you can mount them to a wooden frame. Make sure the pins are facing the outside. Like little claws, the pins are angled for gripping and securing the fabric after stretching. 3. 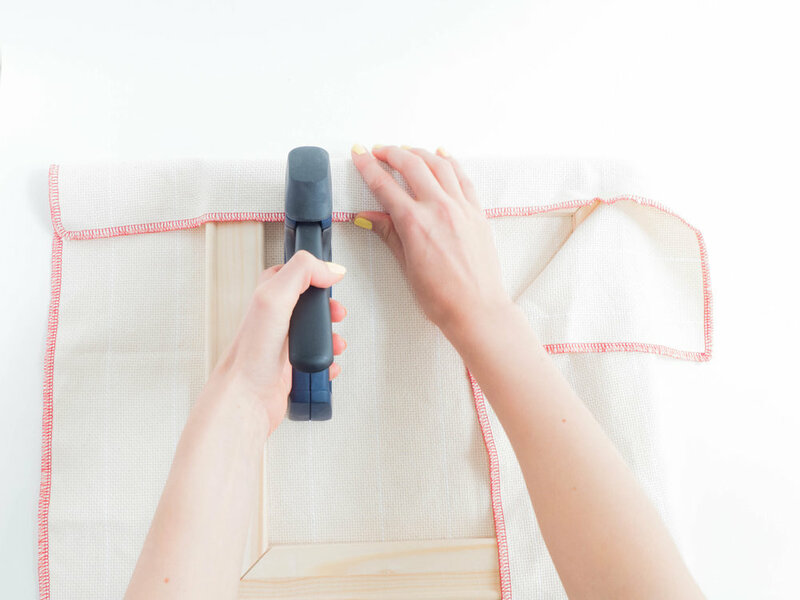 You can purchase stretcher frames in my shop and use a staple gun to tighten the fabric around the wooden frame. It's best if the staples don't go all the way into the wood so you can easily remove them again using pliers or a screwdriver.